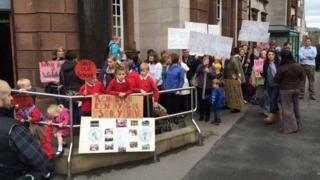 Plans to close three primary schools in Denbighshire have been given the go-ahead by the county council's cabinet. The plans include merging Welsh-medium Ysgol Pentrecelyn and bilingual Ysgol Llanfair Dyffryn Clwyd in Ruthin. About 30 people from Ysgol Pentrecelyn, concerned about the impact on language, demonstrated against the plans before the cabinet meeting began. The closure of Ysgol Rhewl was also approved, but members voted to consult on the closure of Ysgol Llanbedr. The demonstrators want the new area school to be designated category one Welsh medium, instead of being a dual-language school. Cabinet members heard there was a risk parents of non-Welsh speaking families would choose to send pupils to English medium schools in Ruthin if this happened. A council report says all alternatives have been considered and a new single premises for the pupils of Ysgol Pentrecelyn and Ysgol Llanfair DC would be built by September 2017. Last year a move to shut Ysgol Llanbedr was halted by education secretary Huw Lewis, so a further consultation will take place. The cabinet stressed that if the Church in Wales wished to present any proposals for the merger of Ysgol Llanbedr with another school, they should do so.